Pineapple grows very well with the use of chemicals and being a short duration crop gives farmers quick money. However I wanted to try out some new technique that could produce huge quantity even in small area. The solution was found in ultra high density farming. Next I decided to grow banana because the demand of this fruit is quite high as compared with pineapple or other fruits. It is a fruit common man loves to eat in our country! In ultra high density plantation tubers are grown keeping the distance of 7x4x3 feet (distance between rows is 7 feet, plant to plant 4feet, length 3feet). This formula accommodates 2640 plants in one acre which gave us 58tons of banana. It is a proven technique! I am successfully using it for couple of years now. I grow robusta and yelakki varieties of banana. In the beginning I tried the technique in 3 acre but later expanded the cultivation to 30 acre as the results were fantastic. The first batch of saplings was tissue culture plants bought from Bangalore. Later I have developed it in my own farm. To make the planting material, we remove the tuber of the banana plant and make it like a ball by removing thin skin. 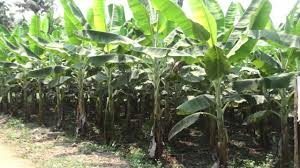 It is then treated with the mixture of cow dung slurry, DAP, Phosphorus, Monocrotophos or chloropyrifos (insecticide), M45 or Carbendazim (Bavistin) (fundicide), four eight (nematode controller) and keep it for 15-20days before planting. With this mixture the growth of the tuber will be good and it will have strength to fight with the disease or pest attack if any.We first create a bed and keep the treated tuber, it will sprout after 20-22 days. Later it is transplanted in the farmland keeping the mentioned distance. Plants might get infected by panama disease, sigatoka disease (leaves dry) etc. We reduce nitrogen if there is panama disease and use trichoderma, pseudomonas etc. Mostly there will be no mortality of the plant but if it happens then it is removed. Replacement is not possible in the technique else the height and growth of the plants will not be uniform! Every plant needs equal sunlight. Soil is nourished with chemical fertilizers like NPK, zinc, magnesium, boron in required quantities. The plant gave three yields, at first 40 tons, 50tons and in the end I could get 58tons. On an average 30kgs/plant was the banana yield. Entire produce is sold from the farm gate. Robusta was sold at Rs. 5-20/kg and Yellaki banana was sold at Rs. 10-25/kg. Post harvesting banana after three yields, we remove the leaves and allow the stem to dry/uproot naturally. One young bud in every plant sprouts on its own and it will be allowed to grow. We take first and second crop and the plant dies on its own. Ultra high density farming technique is very good and farmers can reap good returns implementing it on their fields. Plant yield largely depends on the fertility of the soil. It demands constant hard work, concentration and supervision of the farmer. I have come a long way from rags to riches in agriculture by learning new techniques and working in the fields sincerely. Soil will give back as it is taken care. Forever loss is not possible in agriculture, it could be momentary that is a sign for the farmer to upgrade his skill set in farming practices and start fresh for higher profits!